Ron Cembrowski covers the April 2017 air show held at Gatineau-Ottawa Executive Airport with photos taken on the beautiful practice day as well as in the pouring rain on Sunday to witness the participation of the Patrouille de France while on their North America tour. In celebration of the 150th anniversary of Canadian Confederation (1867 - 2017) and the 100th anniversary of the First World War (WWI) Battle of Vimy Ridge in France (April 9 - 12, 1917), "Aero 150 Air Show" was held at the Gatineau-Ottawa Executive Airport (CYND). The show was scheduled for one day, on Sunday, April 30, 2017. Gates opened at 9:00 a.m., with a static display available for viewing all day and the flying display running from 1:00 p.m. to 4:00 p.m. 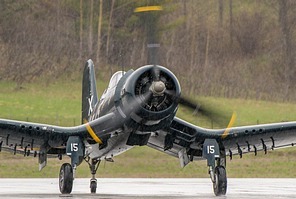 The show was hosted by Vintage Wings of Canada and the City of Gatineau. The Aero 150 show replaced the annual Wings Over Gatineau (Gatineau EnVol) show which was to have taken place in June. The decision was made to hold Aero 150 after the Patrouille de France, the French Air Force Aerobatic Team, offered to visit Gatineau as part of its 2017 North American tour and to commemorate Canada's 150th birthday and 100 years since the Battle of Vimy Ridge. This was the only Canadian stop for the French team, which was on a tour of the United States commemorating 100 years since the U.S. joined the Allies in the First World War. The Royal Air Force sent two Eurofighter Typhoon FGR4s from 1 (Fighter) Squadron, based at RAF Lossiemouth in northern Scotland. Both Typhoons were on static display. The squadron had been participating in a large multinational exercise in Langley AFB, Virginia, in the U.S., for the previous 3 weeks, training alongside USAF F-22, F-35 and French Air Force Rafale fighters. C-90B King Air from 3 Canadian Forces Flying Training School (CFFTS) operating in partnership with Allied Wings Ltd., based at Southport Aerospace Centre, Portage la Prairie, Manitoba - on static display. The aircraft carried special markings in the form of nose art, "Lonesome Polecat" and serial number "HK425". These markings originally appeared on a WWII deHavilland Mosquito N.F. MkIII, operated by RCAF 409 Squadron (squadron code: KP) in 1945. The crew flying this Mosquito were credited with a triple victory on April 23/24, 1945, having destroyed two Ju 87s and one FW 190. Pair of Harvard II trainers from 2 Canadian Forces Flying Training School (CFFTS) based at CFB Moose Jaw, Saskatchewan - on static display. One of the Harvard IIs was in the special WWII British Commonwealth Air Training Plan (BCATP) trainer yellow colour scheme (painted in 2016) of RCAF No. 2 Service Flying Training School (SFTS), Uplands, Ontario. Pair of CT-155 Hawk trainers also from 2 Canadian Forces Flying Training School (CFFTS) based at CFB Moose Jaw, Saskatchewan - for the flying display. CP-140 Aurora from 407 (Long Range Patrol) Squadron based at CFB Comox, British Columbia - flying display. 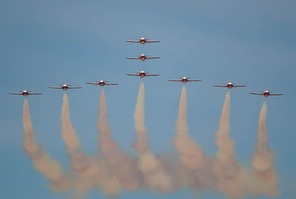 Due to the ramp congestion caused by the presence of the Canadian and French Air Force aerobatic teams plus the French Air Force support aircraft, the Aurora staged out of Ottawa Macdonald-Cartier International Airport (CYOW). 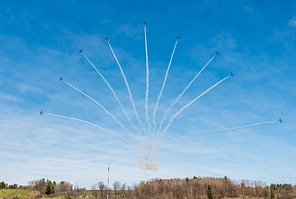 The Aurora flying display also included a "touch and go" at Gatineau. CH-147 Chinook helicopter from 450 (Tactical Helicopter) Squadron based at CFB Petawawa, Ontario. The Chinook was used by the Canadian Forces SkyHawks as their jump platform. Aero L-29 Delphin (C-GGRY) operated by ACM (Acer Cold War Museum), a non-profit organization, based at the Edenvale Aerodrome in Stayner, Ontario. The Canadian Forces Snowbirds kicked off their 2017 air show season at the Aero 150 show. The Snowbirds, officially known as 431 (Air Demonstration) Squadron are based at CFB Moose Jaw, Saskatchewan, and fly the CT-114 Tutor jet. The photos up to this point were taken on the Air Show Practise Day/Media Day held on Saturday, April 29. On the show day Sunday, April 30, the weather was less than ideal. The Patrouille de France arrived mid-morning on Sunday and so were not part of the Saturday Practice Day/Media Day events. The French Air Force (Armée de l 'Air) sent with two support aircraft, the old C-160R Transall had arrived on Saturday while the new A400M Atlas arrived with the team on Sunday. Unfortunately the Sunday show day weather had very cool temperatures (6°C) and rain most of the day. The poor weather didn't stop the show, but did limit the air displays. The Snowbirds performed their "low show" and the Patrouille de France, who as the final act closed the show, limited their performance to the full formation flypasts as the weather had deteriorated even further by the end of the day. Nonetheless it was a pleasure to see the French team as appearances in North America are very rare. The last time the Patrouille de France performed in Canada was in 2009, in Quebec City. Gatineau-Ottawa Executive Airport (CYND) is located approximately 2 km northeast of the City of Gatineau, Quebec. The City of Gatineau is located on the northern bank of the Ottawa River, immediately north of Ottawa, Ontario, the Nation's Capital. Together, Ottawa-Gatineau form Canada's National Capital Region. The airport has a single east-west 6,000 ft x 150 ft runway, Rwy 09-27, and is equipped with Canada Customs facilities for aircraft arriving from outside of Canada. Surrounded by the picturesque rolling hills of the Gatineau region, the location provides a pleasant backdrop for photography and a welcome change to the standard industrial location and look of many other airports. The airport is also home to Vintage Wings of Canada, a not-for-profit, volunteer led organization founded in 2003 by Ottawa philanthropist Michael Potter. Vintage Wings is a flying museum that celebrates Canada's rich military aviation history, particularly from the Second World War (WWII). Most of the aircraft in the Vintage Wings collection are in flying condition or are being restored to flying condition. The collection is housed in a 23,000 sq ft hangar designed to resemble a wartime hangar. Fairchild Cornell (CF-YQR) Elementary Flying Trainer, built in June 1943. The aircraft is painted in its original markings, aircraft 10712, when it operated from No. 15 Elementary Flying Training School, Regina, Saskatchewan, during WWII. 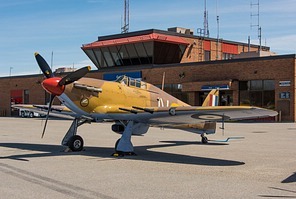 Harvard Mk IV (CF-ROA) painted in the markings of Harvard 2866 of WWII RCAF No. 2 Service Flying Training School (SFTS), Uplands, Ontario (Harvard 2866 was known to have been flown by Pilot Officer John Gillespie Magee, author of the poem High Flight). Lysander Mk IIIA (C-FVZZ) army cooperation aircraft, built under License at National Steel Car Corp., in Malton, Ontario. The aircraft is painted as the first production and test aircraft No. 416 from National Steel Car. The air show was free to the public with donations being accepted by Vintage Wings. In addition, the public could purchase tickets to the "VIP Hawk One Chalet". The chalet provided a terrific, unobstructed view of the show line and included a private tent area, catered lunch, and cash bar, and is definitely worth considering at a future Gatineau air show. I would like to thank Mr. Girvan Patterson, Marketing Director, Gatineau Air Shows / Aero 150 and the air show volunteers for their kind support during media day.